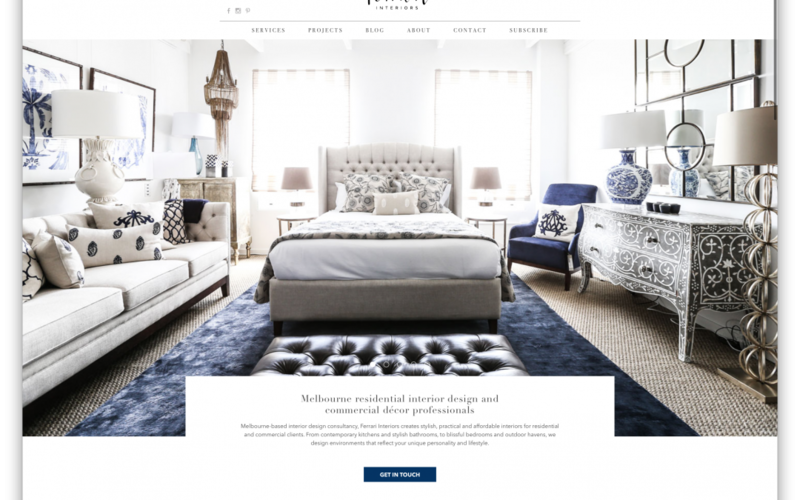 Ferrari Interiors director Bernadette wanted to redesign her website so it reflects the quality of her work and creates more leads. She is a luxury residential interior designer and decorator who has been renovating beautiful homes in the southern eastern suburbs of Melbourne but she felt her old site didn’t appeal to her demographic. First we redesigned the website with a minimal interface and bright, airy colour pallets for visitors to feel comfortable. The old site had a single images with a top navigation. By increasing the realestate of the site vertically, it allowed us to display more images and content on the homepage. This resulted in users staying longer on the page and clicked around to learn more. In this case, they were learning more about the client’s projects. We added a project query form so that it’s easier to identify the quality of the lead before she responds to them. Bernadette use to get a lot of low quality query phone calls, which she wanted to move away from. The query form was also integrated to an inbound marketing tool – Hubspot for further insights (specific page views) on customers behaviours so that Bernadette could personalise her email response and continue engagement with email marketing. This strategy maximises her traffic to lead conversion rate. We created digital marketing on number of social media sites especially Pinterest where most of her demographic target spends a lot of time. We also ran some ads on Facebook with geo targeting towards groups using their age, income level and specific behaviours. We also made sure to boost traffic to highly engaging editorial blog articles. Each blog is carefully drafted with target keywords and finished with a strong call to action. This was enough to keep the site active and optimised organically. If you like to hear more about how our website redesign strategy and see if it could benefit your business, feel free to fill out the form below for free consultation. How to maximise your online sale.